When Grace, an exceedingly competent and devoted therapist in Montreal, stumbles across a man who has just failed to hang himself, her instinct to help kicks in immediately. Before long, however, she realizes that her feelings for this charismatic, extremely guarded stranger are far from straightforward. In the meantime, her troubled teenage patient, Annie, runs away from home, and soon will reinvent herself in New York as an aspiring and ruthless actress, as unencumbered as humanly possible by any personal attachments. And Mitch, Grace’s ex-husband, a therapist as well, leaves the woman he’s desperately in love with to attend to a struggling native community in the bleak Arctic. We follow these four compelling, complex characters from Montreal and New York to Hollywood and Rwanda, each of them with a consciousness that is utterly distinct and urgently convincing. 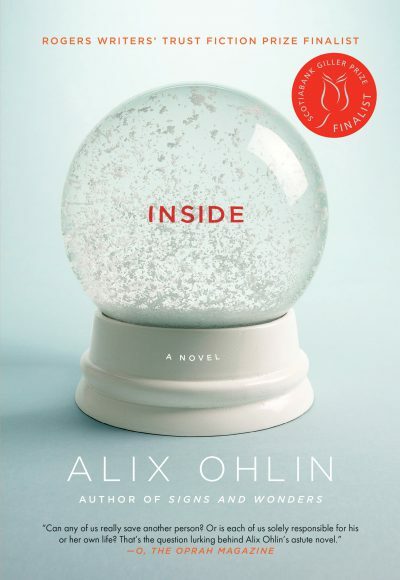 With a razor-sharp emotional intelligence, Inside poignantly explores the many dangers as well as the imperative of making ourselves available to—and responsible for—those dearest to us.